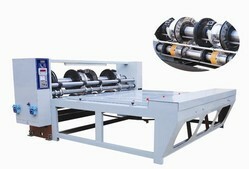 We are engaged in offering a quality approved range of Combined Rotary Creaser Slotter Machine. We offer an extensive range of Combined Rotary Creaser Slotter to our clientele. These products are made using the optimum quality material and advanced techniques. 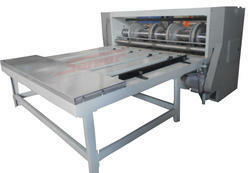 Machine Size: Vary from 85"
We are manufacturers of RS4 Combined Rotary Slotter Machines in Amritsar, Punjab, India. The machine and the worktable are installed together.Paper/Sheet is fed by chain manually. Pressing, trimming slotting and cutting can be finished once. The main machine is controlled by frequency control device. Backed by rich industry experiences, we are highly engaged in manufacturing, trading and supplying a premium quality range of 4 Bar Rotary Slitter Creaser. Size In Inch: 75", 85", 95", 105"
We are offering Combined Rotary Creaser to our client.